The controller also comes bundled with some exclusive DLC. Rare’s upcoming pirate-themed adventure game Sea of Thieves isn’t due to arrive until late March of this year, but fans who want to show off their excitement for the game ahead of time will soon be able to buy a special Sea of Thieves-themed Xbox One controller which will come packaged with some extra digital goodies to boot. 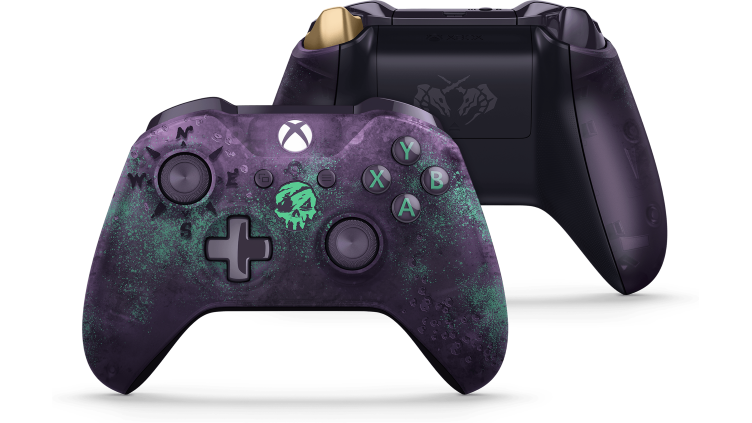 The Sea of Thieves Xbox One controller will feature a special translucent purple finish and light green accents which include a green skull right in the center of the controller’s faceplate that glows in the dark (plus a ‘Crossed Unicorns’ symbol on its back battery pack cover). According to the Sea of Thieves controller’s Microsoft Store page, it will be available on February 6 (and can be pre-ordered right now) and costs $74.99. The controller is also part of the newer generation of Xbox One controllers which means it has built-in Bluetooth functionality and thus can be used with Windows 10 PC’s and tablets without the need for any kind of adapter. Those who purchase the controller will also receive an exclusive ‘Ferryman Clothing Set’ cosmetic DLC pack for use within Sea of Thieves as well as 14-day free trials for both Xbox Live Gold and the Xbox Game Pass. Xbox Live Gold will allow players to take full advantage of Sea of Thieves’ online functionality while the Xbox Game Pass allows subscribers to freely download and play a massive library of 100+ games. While the Sea of Thieves controller will be available as of early February, Sea of Thieves itself isn’t scheduled to launch until March 20, at which point it will be available for both Xbox One and PC. If you need a refresher course on everything you should know about Sea of Thieves ahead of its launch, our recent guide on just that subject should have you covered.